Franz Kafka remains one of the most influential writers of the twentieth century. His novels, stories, and letters are still regarded today as the epitome of the dark, fascinating, and uncanny, a model of the modernist aesthetic. 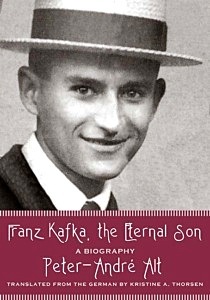 Peter-André Alt’s landmark biography, Franz Kafka, the Eternal Son, recounts and explores Kafka’s life and literary work throughout the cultural and political upheavals of central Europe. Alt’s biography explores Franz Kafka’s own view of life and writing as a unity that shaped his identity. He locates links and echoes among the author’s work, life, and surroundings, situating him within the traditions of Prague’s German literature, modernity, psychoanalysis, and philosophy as well as within its Jewish culture, arts, theater, and intellectual tradition. In this biographical tour de force, Kafka emerges as an observant flaneur and wistful loner, an anxious ascetic, an ecstatic and skeptic, a specialist in terror, and a master of irony. Alt masterfully illuminates Kafka’s life not as source material but as a mirror of his literary genius. Readers begin to see Kafka’s unforgettable novels and stories as shards reflecting the life of their creator. Peter-André André Alt is a German literary scholar and the president of the Free University in Berlin. Kristine A, Thorsen is a lecturer emeritus of German at Northwestern University.